Bookmark this page if you are interested in space and like photographs, or especially if you have a friend that should be interested in space but isn't for some reason. It's a diary entry from Daily Kos, and features a simply massive amount of photographs of all the objects in the Solar System from Mercury out to Saturn, including not just planets but also asteroids as well. Due to its massive size it was only able to make it out that far, but Part II should be coming out later which will complete the rest of the Solar System. 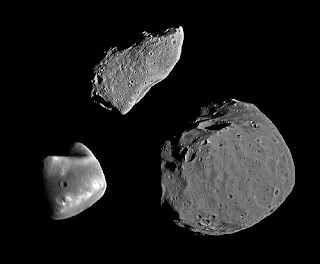 The asteroid photos are particularly interesting as many of them have been scaled in order to show their respective sizes, such as this one showing the relative size of asteroid 951 Gaspra compared to Phobos and Deimos. Another interesting image there shows the size of Washington D.C. compared to another asteroid. Showing the surface area of objects is especially important in my opinion, and I've written a post on a similar subject here as well (along with a few others).